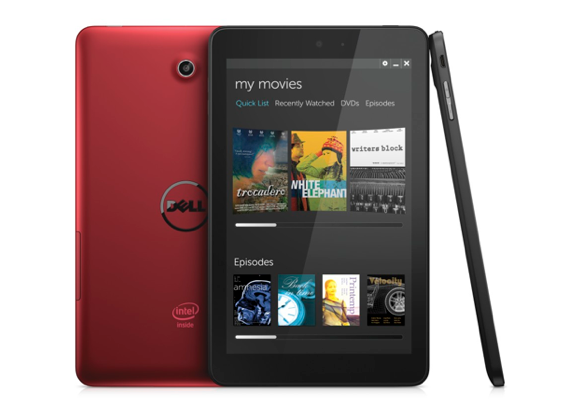 The Android tablets from Dell include the Dell Venue 7, which will have a 7-inch screen, and the Venue 8, which will have an 8-inch screen. The Venue 7 will be priced at $149, and the Venue 8 will be priced at $179. The Venue 7 and 8 run on older Intel Atom processors that were announced last year, and not the latest Atom processors code-named Bay Trail. Both tablets have screen resolutions of 1280 x 800 pixels, Micro-SD slots and Wi-Fi. The Venue 8 Pro has a Bay Trail processor and up to 64GB of storage. It has a 1.2-megapixel front camera and a 5-megapixel back camera. It weighs 388 grams. The Venue 10 Pro has a range of processor options ranging from Bay Trail to the latest Haswell processors. The device weighs 726 grams. It has up to 256GB of storage, NFC capabilities and a 2-megapixel front camera and an 8-megapixel back camera. Other features on Dell's new Venue Pro tablets with Windows 8.1 include Micro-SD card readers and LTE mobile broadband connectivity. The new tablets also indicate that Dell is retaining its PC division. Michael Dell reassured customers that the company would retain its PC division after shareholders last month approved a deal in which the CEO and associate Silver Lake Partners would take the company private for $24.9 billion. It had been speculated that the poorly performing division might be axed after the company goes private. Updated at 11:53 a.m. PT to include more tablet specifications.